It was another quiet Sunday morning in the Houston metro area before residents were awakened by a bolstering fire and smoke when a storage vessel caught fire and quickly clouded the sky. One of the greatest safety concerns among many chemical plants and other industrial facilities had become a reality. When a fire breaks out, normal operations can turn into chaos and life-threatening situations can develop within seconds as evidenced by the Houston fire and others. For this reason, fire performance must always be evaluated when selecting piping materials, including thermoplastics. Designers and engineers should select engineered systems with proven performance and properties such as a low flash ignition temperature, burning resistance, flame spread resistance and limiting oxygen index (LOI) to create a safer, more reliable and productive environment. It was in 1911 that the ASME Boiler and Pressure Vessel Code (B&PVC) became a topic of great discussion born out of the need to protect public safety. Invention of the steam engine, boilers, and other sources of pressure systems made it apparent that something must be done. 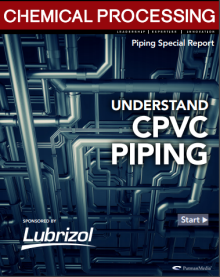 Threading and Flanging CPVC Piping Systems Issues that develop in piping systems often involve connections, which is why it is important to select and properly install all transitions/connections. Depending on the application and the pipe size, CPVC pipe transitions may be threaded or flanged, although flanging is generally the preferred method especially when disassembly is required. Based in Ocean Springs, Mississippi, B & D Plastics is a leader in the design and fabrication of fiberglass and dual laminate process equipment. The company sought a material that would provide the mechanical strength and chemical resistance needed to enhance the structural integrity of its fabricated composite structures, including scrubbers, towers, evaporators, precipitators, clarifiers, storage tanks and piping systems. Corrosion is a widespread and expensive problem that impacts every industry around the globe. In 2016, NACE International released the "International Measures of Prevention, Application and Economics of Corrosion Technology (IMPACT)" study, which estimated the global cost of corrosion at approximately $2.5 trillion (USD). Is Your EPC Project Team Diverse Enough to Bring Value? The goal for all design/build teams is to deliver a project that is in spec and under budget. One key to meeting this goal is to involve the proper engineering, procurement and construction personnel throughout the design/build process – whether the individuals are internal experts or outside consultants. Team members should bring the right blend of experience, expertise and curiosity about innovative new products to achieve the desired results. Mineral processing plants require safe, reliable piping systems that ensure facilities remain operational and more productive over the long term. But, mineral processing facilities present tough challenges for piping systems, including the presence of aggressive chemicals, temperature extremes, continual exposure to ultraviolet radiation and more. Every company has safety policies to protect its workers, and employee safety should always be the most important consideration when selecting an industrial piping system. Is the piping system functional and reliable? Will it provide the long-term performance expected without bursting or resulting in leaking pipe that can expose workers to dangerous chemicals? Power generation plants of all types – from gas turbine combined cycle to combined heat and power – move large quantities of water, caustics and corrosives. Corzan® CPVC (chlorinated polyvinyl chloride) piping has provided operational advantages and cost savings to the power generation industry for decades, enhancing performance in a range of applications in new and existing facilities for long-term reliability.